…and experience an unique experience immersed in the magical atmosphere of Piazza Navona. Why book a restaurant in Rome? Rome offers thousands of restaurants to spend your evening feasting on delicious food, but few can provide the exquisite cuisine and unique location found in Piazza Navona, one of the most beautiful squares in the world, brimming with art and history. Cybo in Piazza offers it all! 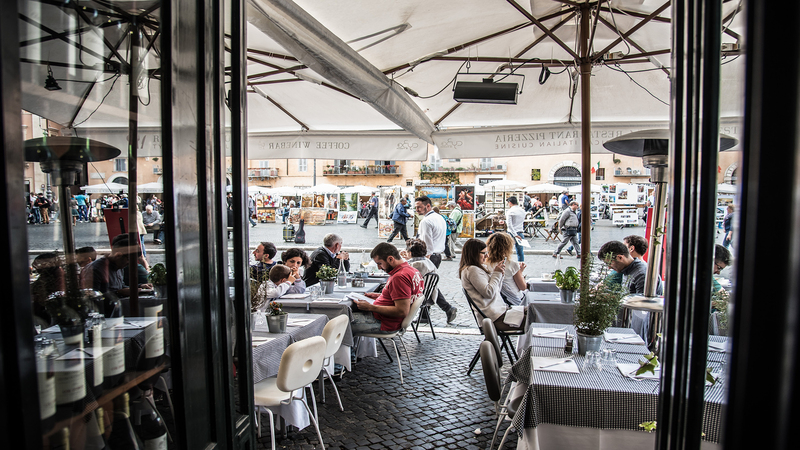 Book your table now and ensure you receive the best available table in the middle of Piazza Navona. One of the most beloved restaurants of Rome, Cybo in Piazza welcomes its guests to enjoy its contemporary and traditional italian cuisine, with warm hospitality and impeccable service. The chef’s menu follows the seasons, creating elegant rustic dishes composed of a selection of raw materials hand picked from local suppliers. Cybo in Piazza is not only a restaurant, but also a Cafeteria and a Wine Bar. An ideal location to spend pleasant and relaxing moments. Stay in contact with us, follow us on Facebook and subscribe to our Newsletter to receive news on events and updates on our menu. Share your photos with us and we will add them to our client album.